I feel this is an important event because we are the anchors for transformation on our planet. I honor and acknowledge you for the true service that you do offer. I know you sometimes worry about humanity’s capacity for real change. The kind of change that will end the worst kinds of suffering and injustice and enable every being in our world to thrive and share their deepest gifts. Regardless of your skepticism (or even your despair), in your heart you probably hold some kind of vision that such a world is possible. I also believe it’s possible to make this dream our reality, but it takes evolving our consciousness AND our society. This is why I want to invite you to join together for the Co-Creating Heaven on Earth summit. It’s time to blend our highest hopes for humanity with practical strategies for positive change…. It’s a wonderful honor for Morning Messages to be one of the sponsors of this truly paradigm-shifting event.You’ll hear from more than 15+ speakers — thought leaders like Jack Canfield, Dr. Eben Alexander, don Miguel Ruiz, Barbara Marx Hubbard, Andrew Harvey, Anodea Judith and many others. They’ll be sharing their visions for what it means to co-create Heaven on Earth, and practical strategies that will help make it a reality! I hope you’ll participate in this unprecedented online gathering presented by The Shift Network, November 3-5. 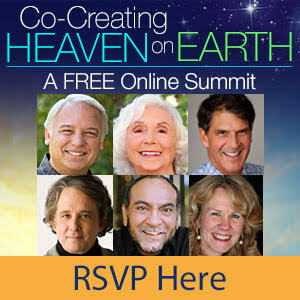 RSVP here for the Co-Creating Heaven on Earth summit — at no charge. I am thrilled at the prospect of your presence, as we unite to discover new paths that will make bold, beautiful visions achievable.This powerful event is your chance to be inspired by some of the most innovative luminaries of our time — and discover practical, game-changing strategies for how we can extending the basic foundations of for a thriving life for ALL of Earth’s citizens. You’ll come away engaged, empowered & better equipped to be a change leader. You’ll discover what you can do to sow the seeds of this vision into your spiritual practice, your relationships and your spheres of influence, and also become activated to ignite global transformation through inspired action. Every culture has some vision of “heaven” as a higher possibility for being: The Promised Land. Paradise. Shangri-La. Nirvana. Utopia. Instead of imagining heaven as something that happens in an afterlife, it’s time to see that we have the potential to create that higher state here and now. Together we can bring that beauty and perfection into real, living form. The seeds for it exist in our own consciousness, for us to collectively birth that possibility. Join me and the Morning Messages family and the amazing panel of other summit presenters. Together, we will help activate expanded visions for humanity, and engage in their co-creation!